So where did all the weeds come from? Weed seeds can remain dormant in soil for years. They wait until the proper environment is created to grow. Poor soil is the common culprit for most weed infestation. Tilling the soil, while creating a nice seed bed, also brings dormant and buried weed seeds to the surface. Top soil has weed seed in it and will bring problems, as well. Processed loam is not weed-free. Even wind carries weed seeds. The bad news is weeds are everywhere. The good news is they can be properly controlled. Weeds growing in a nice lawn disrupt the visual beauty and uniformity of it. The irregular leaf shapes, growth habits, and color differences of weeds make them highly undesirable in homeowner lawns. Planting of inferior turf varieties. Poor soil management, such as improper pH readings, soil compaction, and lack of organic matter. Bad turf management practices, like inadequate fertilizer programs which greatly overuse synthetic, high-nitrogen “lawn foods” only. Physical damage caused by low mowing height or excessive wear patterns mainly caused by equipment activity. It is evident that a healthy growing lawn via better cultural practices is your first – and best – line of defense against weeds. Lawn weeds can be divided into two basic groups – grassy weeds (crabgrass, goosegrass, orchardgrass, etc.) and broadleaf weeds (dandelions, clover, chickweed, etc.). Now that we’ve learned weed seeds are unavoidable, how can we treat them? Selective herbicides are classified as pre-emergent or post-emergent depending on the time that the control product is applied to the grass and/or the weed. Pre-emergent herbicides. Pre-emergent herbicides are applied to the turfgrass site prior to weed seed germination and form a barrier at, or right below, the soil surface. These products prevent cell division during the seed germination process. Grass seed cannot be planted until four months after applying pre-emergent products. (If you apply a pre-emergent in the spring, then you won’t seed until the fall. If a pre-emergent is used in the later summer or early fall, then you won’t seed until the spring.) There is only one product that allows homeowners to seed AND prevent crabgrass all at once. 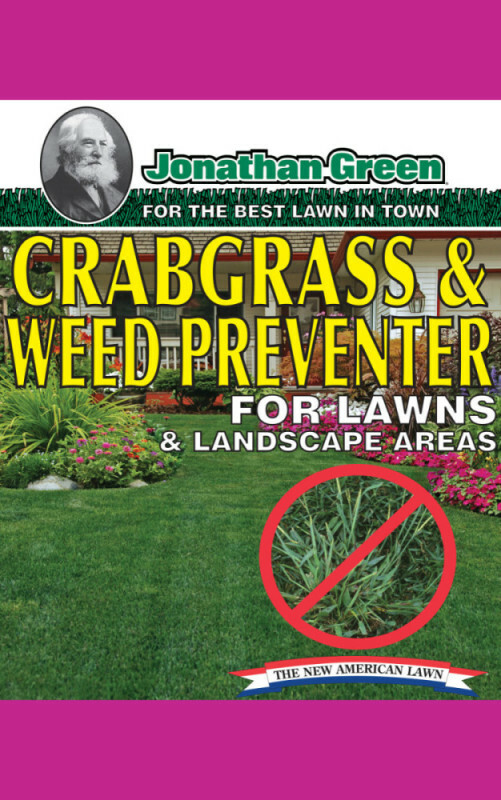 It is called, Jonathan Green Crabgrass Preventer Plus New Seeding Fertilizer (see below). 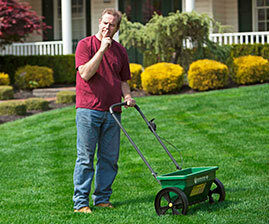 Green-Up Lawn Food with Crabgrass Preventer. This combination of lawn food and weed preventer feeds lawns for up to three months and provides both pre-and-post emergent crabgrass control. Green-Up Lawn Food with Crabgrass Preventer not only prevents crabgrass (and many other grassy weeds) all season, but also controls crabgrass after it grows up to the third-leaf stage! It can be applied as early as mid-March or as late as early June. 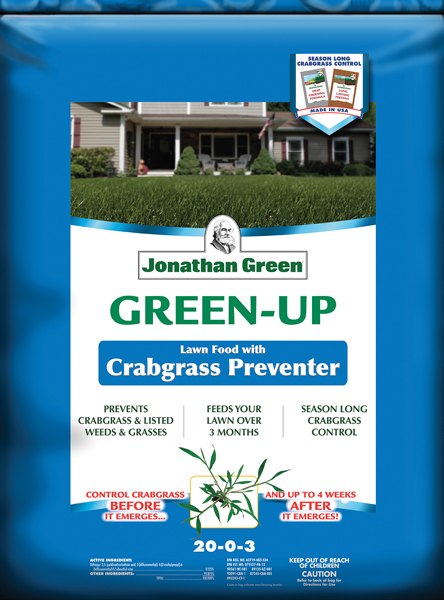 Jonathan Green Crabgrass Preventer Plus New Seeding Fertilizer. If you want to seed in the spring AND prevent crabgrass, then Crabgrass Preventer Plus New Seeding Fertilizer is your choice. This unique combination product feeds the lawn for up to two months, prevents crabgrass for up to one month, and allows users to seed their lawn on the same day! How? By using a special ingredient called, “Tupersan”, which can tell the difference between weedy grasses and good grasses. Though the pre-emergent control is far less than normal crabgrass preventers (one month versus four months), Crabgrass Preventer Plus New Seeding Fertilizer allows lawn owners to seed where traditional preventers do not. Thus, the newly sown seed will germinate before the crabgrass does! This action, in turn, “crowds out” crabgrass seeds from growing in the turf. Crabgrass does not grow in shade. Therefore, reduce your use of crabgrass control products by applying them only in sunny areas of the lawn. If Annual Bluegrass (Poa Annua) has been a problem in the lawn, a second application of Green-Up with Crabgrass Preventer can be applied around Labor Day to provide control of this problematic lawn weed. Corn Gluten Weed Preventer. 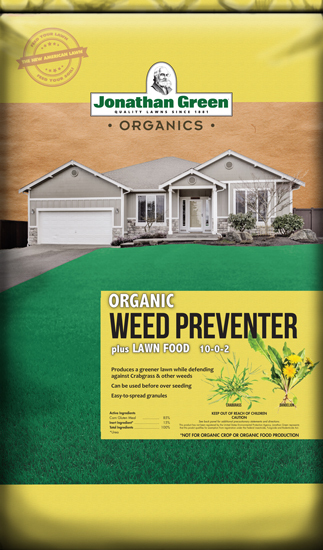 This organic pre-emergent controls the most common grassy and broadleaf weeds, including crabgrass and dandelions. It must be applied early in the spring as a pre-emergent, before crabgrass or broadleaf weeds germinate. Corn Gluten Weed Preventer contains a patented corn gluten that feeds the lawn for eight weeks and is safe to apply where children and pets play. Post-emergent broadleaf herbicides are applied directly to actively growing weeds in the lawn. They are effective in controlling a great variety of weeds such as dandelions, plantains, chickweeds, ground ivy and many more. 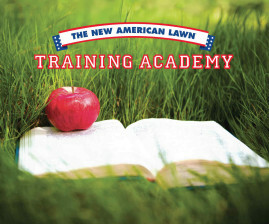 Successful broadleaf lawn weed control happens only when the herbicide granule adheres to the weed leaf. Therefore, the weed should be wet prior to application for maximum control. Apply broadleaf weed controls after watering the lawn or in the early morning to a dew-filled lawn. Do not water the lawn for two days after application. 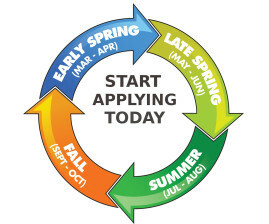 Accordingly, make sure there is no rain forecasted for two days after application. Do not apply broadleaf weed controls when the temperature is above 85°F and refrain from mowing for two days after application. Grass seed can be applied four weeks after application. Green-Up Weed & Feed. This combination of lawn food and weed control feeds lawns for up to three months and tackles over 250 broadleaf weeds, including dandelion, chickweed, plantain, and clover. Green-Up Weed & Feed has a three-way herbicide formula to insure that smaller, less leafy weeds get killed, too. Lawn Weed Control. 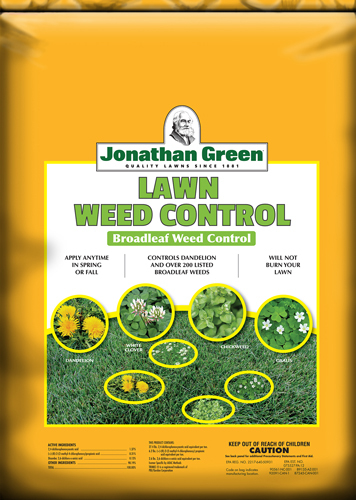 If you just fertilized and did not use a broadleaf weed killer, then you may apply Jonathan Green Lawn Weed Control (with no fertilizer) to the turf. Like Green-Up Weed & Feed, Lawn Weed Control controls over 200 broadleaf weeds, including dandelion, plantain, clover, and chickweed. Follow the same application rules (listed above) for broadleaf weed killers. How does Crabgrass work? 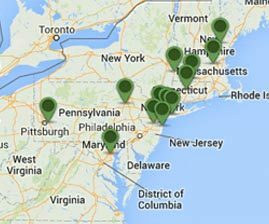 Which Crabgrass Control is right for you?